Body length, 6-9 mm. Upper side grayish or brownish, underside covered by whitish scales. Rostrum slightly elongated, distinctly narrowed apicad. Epistome and outside surface of mandibles covered with goldish scales. Eyes strongly convex. Pronotom weakly transverse, disc of pronotum rather coarsely punctuated. Coxal excavations of forelegs extending to transversal sulcus of prosternum. Scutellum large, covered with radial scales. Elytral striae rather coarse, intervals covered with short setae, odd intervals occasionally lighter. Preapical abdominal segment of larva dorsally with 4 long setae along posterior margin of tergite and with 2 shorter setae in middle part. Abdominal apex of pupa with 2 large spines and 3 additional spicules. Fresh egg is elliptical, 0.72-0.89 mm in diameter. At the beginning it is yellowish-white, 2-3 days later it becomes shining black. Major part of Europe with Scandinavia. It inhabits the European part of the former USSR from forest-steppe zone of Ukraine northward to Baltic States and eastward to Nizhnii Novgorod Region. Monovoltine. Lupinus angustifolius L., Lupinus albus L. and, to a lesser degree, Lupinus polyphyllus Lindl., Lupinus luteus L., are the main host plants. Occasionally the pest feeds on Caragana arborescens, Ornithopus sp., Cytisus sp., Ononis sp., Melilotus sp., Genista sp., Vicia sp., Medicago sp., Onobrychis sp. Larvae are absent on haricot, chick-pea and Caragana arborescens. Spring activity begins in April, at 10°C. Flight of adult begins at air temperature 18-21°C. Mass appearance of adults occurs in May, at temperature about 20-25°C, and coincides with appearance of lupine seedlings. Oviposition begins soon after hibernation and lasts 75 days. Fertility on lupine is about 500 eggs, on alfalfa 250. Embryogenesis lasts 8-14 days. Larvae hatch in the 2nd half of May, during the forming of root tubercles, and disappear at the end of July . August. Larva has 4 instars, its development lasts 25-30 days. Initially, larvae feed by tubercles, later by roots. Peak of the larvae abundance (200 specimens per sq. m.) usually occurs in mid-June. Most of them are concentrated at depth 5-20 cm. Larva pupates in the soil cradle, with mass pupation occuring in the beginning of July. Pupa develops 12-13 days. Adult emergence lasts about 1 month beginning the end of June. Adults spread to leguminous crops for feeding. Oviposition starts only after hibernation. Old adults perish before the end of July. During hibernation, the losses of populations from white muscardine are about 70%. Both adults and larvae cause damage. 6-7 adults per sq. m. cause crop losses of lupine seeds up to 50%; 40 specimens of adults per sq. m. destroy all seedlings. During development each larva devours up to 3 root tubercles. Control measures include sowing new fields of lupine at a distance no less than 500 m from the old lupine; deep plowing of lupine as green fertilization during period of mass pupation; sowing of Lupinus luteus which is more resistant against pest. 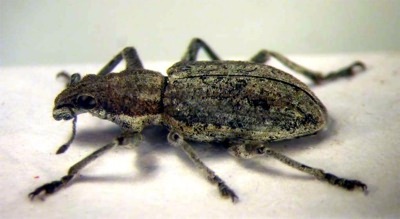 Pesticide treatment is necessary in spring with high abundance of lupine weevil. Areshnikov, B.A. 1956. Biology of Sitona griseus and control measures in Poles.ye region of Ukraine. PhD Thesis. Kiev: Ukr.ASKhN, 14 p. (in Russian). Petrukha, O.I. 1969. The pea weevils of the genus Sitona Germ. from the fauna of the USSR, damaging bean crops. Leningrad: Nauka. 255 p. (in Russian). Rybchin, B.E. 1971. Biology of Sitona griseus in Bryansk region. In: Miller, N.S., ed. Proc. Smolensk and Novozybkov Ped. Institutes, 9. Smolensk: Smolensk Ped. Institute, p. 155-166 (in Russian). Rybchin, B.E. 1971. Microbiological control measure against Sitona griseus. In: Miller, N.S., ed. Proc. Smolensk and Novozybkov Ped. Institutes, 9. Smolensk: Smolensk Ped. Institute, p. 167-172 (in Russian). Rybchin, B.E. 1971. To the question about ecology of Sitona griseus in Bryansk region. In: Miller, N.S., ed. Proc. Smolensk and Novozybkov Ped. Institutes, 9. Smolensk: Smolensk Ped. Institute, p. 173-179 (in Russian).